The relationship between Italians and religion is very special, indeed.We have been a bunch of spiritual people since before the Romans. Italy is, constitutionally, a nation embracing all creeds and religions, where the relationship between State and Church is regulated and sanctioned by constitutional laws. This is especially important as, geographically, the heart of the Catholic Church is within Italian soil. This very presence is rooted in the historical relevance of Rome in the history of Christianity, a relevance that has made the capital of Italy not only the geographical and beaurocratical centre of Catholicism, but also its spiritual core. This is one of the reasons why we are, in the end and in spite of all, a Catholic country. No offense to all other religions welcomed and practiced within the boundaries of Italy, which are all embraced in a beautiful effort of inter-religious dialogue the Vatican itself has been working on with particular zeal, especially since the pontificate of Pope Emeritus Benedict XVI. Each and every faith is welcome: some have been practiced along with Catholicism since the earliest times, like Judaism. Others have become preponderant in much more recent years, as a result of immigration, like Islam. The point, however, is that Italy, not only in her spiritual, but crucially –especially for those who do not believe– in her cultural fabric is profoundly, essentially and innegably Christian. Yes, many will probably criticize this, but one only needs to check out the art and architecture of every single city, town, village in the country, to realize how much of it is related to the presence of the Church. How much of it has been inspired by Christian symbolism. How much of it has been the artistic result of a historical presence of the Church on Italian soil that, positively and negatively, has touched and formed the country throughout the entirety of its history. Christianity, in its more popular aspects, has somehow permeated the lives of the majority of us, especially, I believe, if we grew up in the countryside: grandparents bringing us to mass and teaching us the first, sweet prayers even before we went to school, in a way that nothing had to do with indoctrination, but rather embodied all the beauty and sweetness of an act of protection and love: because there was no malice in our elders’ faith, but just respect for a higher power and hope for a life, at some stage, somewhere, without pain and loss. Even growing up, even now, weeks, months, years, events are all marked by religious recurrences: our most important holidays are Christian, the majority of the fairs and festivals around the country are related to a Christian saint and what the Pope does is still the first thing every Italian channel put on the news, nevermind what else happens. So, yes. Italy is a Christian, more precisely, Catholic country in her spirituality and culture, albeit she has been enriched throughout her history by the presence of a plethora of minorities of the uttermost importance. She is very much Catholic in her heritage. Of course people today do not go to Church as much as they used to do in the past. Of course, agnostics and atheists have grown in number. But the essentiality is, still and always, to keep respectful of all thoughts, ideas and creeds. Now that we have clarified some of the potential misunderstanding about why and how Italy is a Catholic country, we may as well take a quick look and give some useful information on some of our most popular pilgrimage locations, places you and your family, if Catholic, may be interested in visiting when you come to the country. Even if you are not particularly pious, the majority of them are a must nevertheless, for the very reasons we mentioned previously: art, architecture, heritage, they have it all! Beside the destinations we are going to propose here, you can consult the Opera Romana Pellegrinaggi website, the official Vatican pilgrimages body, to know more about destinations (not only Italians, but worldwide) and get a better idea on general costs and requirements. Destinations are many, as every sanctuary, every saintly shrine, every place where a miracle took place is potential destination for a pilgrimage. However, we would like to propose here five of the most practiced holy routes in the country, and address you to a sixth one, the Via Francigena. Rome, Assisi and Gubbio, Loreto, San Giovanni Rotondo and Turin. Rome is Rome, and you do not need to be religious to adore this place: it is perfect for art lovers, food epicureans, night life afecionados, couples, everyone. Of course, Rome is also the centre of the history of Western Christianity and the holy city of Catholics. Of course, the Vatican and all that is connected and annexed to it is the first place to go. In Saint Peter’s, faithful can follow mass in their own language at one of the many altars in the Basilica. They can pray on front of the holy remains of Saint John XXIII and Saint John Paul II; they can kneel of front of the grave of the founder of the Church himself, Saint Peter. While in the Vatican, of course, it is essential to visit the Vatican Museums and the Sistine Chapel, which can be done all at once. Essential to avoid annoying queues and some obnoxious fake tour guides trying to sell you tickets on the spot is to reserve in advance. You can do it easily and comfortably from home, here. In fact, the Vatican website (of which the Vatican Museums page is part) is the place to go to get more information about other central holy destinations in Rome, the papal Basilicas: Saint Peter (San Pietro), Saint John Lateran (San Giovanni in Laterano), Saint Paul outside the Walls (San Paolo Fuori le Mura) and Saint Mary Major (Santa Maria Maggiore). On each of their dedicated pages, you can check out virtual tours, as well as get information on guided tours, liturgical details and masses timetable. These are not the only places of faith in the city, but they are certainly a perfect starting point to experience the spiritual side of our capital. A poignant place to visit for every Christian is, without doubt, the catacombs, where the first Christians used to gather, worship and, indeed, find refuge during persecution. Beside their immense historical and cultural value, the catacombs of Rome seem to painfully stand to remind us all, in case the news were not enough, that the persecution of Man in name of faith is still very much on this earth today. As for Rome, Assisi and Gubbio would be essential destination for anyone coming to Italy, just in name of their sheer beauty. If you are a Catholic, they are also the places that worked as a backdrop to the lives and miracles of two of Italy’s best loved saints, Saint Francis and Saint Clare. In Assisi, you would be able to visit the two basilicas dedicated to Saint Francis, the Basilica Inferiore and the Basilica Superiore, as well as his grave, Saint Clare’s convent and resting place and the majestic Santa Maria degli Angeli, inside which you can still visit la portiuncola, the small chapel where Saint Francis himself used to pray. Gubbio is known as the place where Saint Francis spoke to the wolf and has remained a symbol of the saint’s protection upon animals and creatures of all sizes. The ORP sometimes offers an interesting 3 days tour (leaving from Rome) touching upon Assisi, Gubbio and Loreto, see of a famous sanctuary dedicated to the Virgin Mary and place where, according to legend, her house was moved to from the Holy Land, through the work of the angels themselves. Things may have not gone exactly that way, yet, the house is there. Padre Pio is probably one of the most popular modern saints, one whose image is well sketched in everyone’s mind. He is also one of those saints we can see and experience in an entirely different way, through his movements, his voice and his body language, as plenty of video and audio footage of the brother of Pietrelcina is extant. The places of his life and death are today a preferred pilgrimage destination and probably one of the easiest tours to organize, as many companies today provide them. Once again, it is the ORP to offer an interesting opportunity to visit San Giovanni Rotondo and pray on Padre Pio’s final resting place. The reason we suggest the tours organized by the ORP are chiefly two: the first is their affiliation with the Vatican, which means professional guides, well versed on the subject and reasonable prices. The other is, as you may notice by checking their website, that their pilgrimages tend to leave from Rome, which is very handy for those coming from abroad, as flying on Rome is much easier than flying on, let us say, Perugia or Bari. Moreover, you can use Rome as the central location of your trip and enjoy these relatively short tours on the side. Not many may consider Turin as the destination of a pilgrimage. However, every 25 years as a rule, or in specially pregnant years for the Catholic Faith, the most famous of all relics, the most enigmatic of all shrouds is laid out in the cattedrale di San Giovanni Battista for all faithful to see. The history behind the Holy Shroud of Turin is long and utterly fascinating and it only adds to that aura of mystery surrounding it. 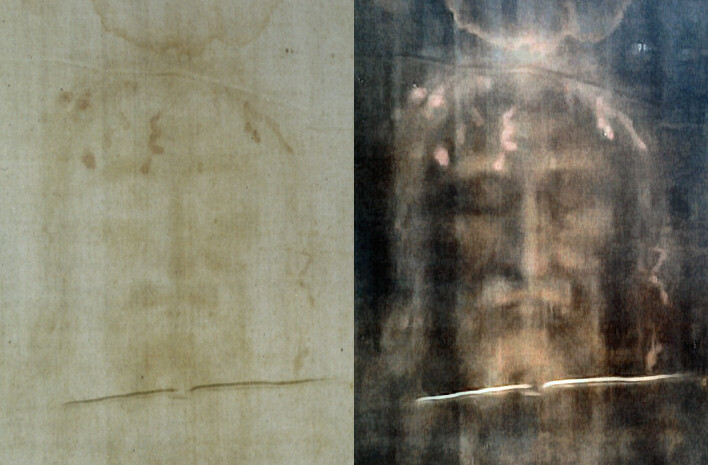 The fact that, because of its fragility and the easiness with which it can get damaged, the Holy Shroud is only visible to the public every given amount of years, it makes every ostension a possibly once in a lifetime event. Faithful from all over the world came to Turin from the 19th of April to the 24th of June 2015 to view the Holy Shroud, displayed to honor the bicentennary of the birth of San Giovanni Bosco, founder of the Salesians. Never speak loud when in a church or a cemetery. Avoid taking photos while mass is said. I mention this because I was recently in Rome and was at mass in Saint Peter’s, when a gang of tourists started taking photos of us, as we were some sort of animals in a zoo: even if you are in a church for the sake of art only, remember they are a place of worship and prayer to many. Girls, when in a church or a cemetery, let’s cover our cleavage and thighs: make sure shorts and skirts are not too short. Mid-thigh is perfectly ok, bum-cheek-skimming is a no-no. No problem with tank tops, maybe just wear a little cardigan on top when you get into the church. It is usually chilly enough inside, so it is, actually, needed most of the time. Boys: wear shirts at all times, please, and cover tank tops, if you are wearing them! If you are planning to visit a church, skip the beach flip-flops. Sandals are ok, but Havaianas are kind of not. No food or drinks are allowed inside churches or museums. If you have visible, large tattoos (on your arms or legs, for instance), cover them. I am tattooed, with a full arm sleeve and a chest piece and I always wear a cardigan and a light scarf when I go to church. Remember to take off hats and caps before getting into a church. If you are with your kids, please keep an eye on them. Many churches are large and safe, yet, that is not an excuse to let children run free in them. Once again, they remain places of worship. And most of all: remember to put your phone on silent!